This presentation by Tim Stonor showcases techniques for capturing the economic performance and social value of places. With tools like “SPACE SYNTAX” and its integration to GIS software, urban / city planning will be a much easier process. The economic principles and trends in our cities can be visually captured and analyzed here when looking into street network design. Safe roads ATX – Where should we focus on? 2015 ended as the year with most deaths in Austin, TX. These “accidents” happened in clusters within the city. Do you want to know where these clusters are? If you click here, a map will show you most of these locations. A map labeled “B” within a circle overlays deaths and sidewalks absent in the city. This is intended to highlight the relationship between most “Accidents” and pedestrian-friendly environments. Automobile-oriented environments see more deaths than pedestrian-friendly areas (I-35, airport blvd). We should create pedestrian-friendly environments where the City of Austin has identified high-priority absent sidewalks. We should retrofit car-oriented areas and convert them to pedestrian-friendly environments. We should prioritize areas where 311 calls are made. We should prioritize areas close to parks where lots of people attend to enjoy nature, festivals, to practice sports, etc. We should prioritize areas close to bus stops, to ensure all non-drivers commute safely. We should prioritize areas where deaths are happening!!. We should select and take action to retrofit areas by overlaying priorities. The pre-conclusion showcased here gives a 35% weight of influence in the decision to map “B” (location of deaths), while giving less influence to other maps. If we want to make our city safe, and if we want to achieve Vision Zero goals (no deaths), can this approach be improved somehow? What would you include / change? *to clarify, each “scenario” (labeled “A” thru “E”) is defined below. Click here for a full resolution graph and analysis. 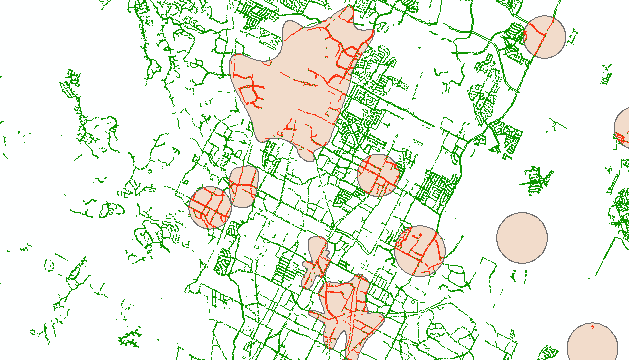 The data used so far is overlaid on the City’s layer for absent sidewalks developed by the City of Austin. A. Clusters of 311 call requests: These clusters are accounting for calls requesting new sidewalks or sidewalk repairs. B. Proximity to accidents causing deaths: In theory, the more attention redesigning these areas, the more accidents and deaths we will avoid. In my opinion this data set has the highest % of influence for this approach. C. Proximity to parks: In my opinion this is a must, but not with a super high % of influence, since parks are mostly pedestrian oriented already. D. Proximity to bus stops: Outside of 300 ft (a block size), the farther away, the less priority (% of influence) should have this data set. E. Bus stop location: Within 300ft (a block size); in my opinion the % of influence of this should be higher than D, but not higher than B. This GIS analysis overlays only 3 sets of data as an example of how a VISION ZERO approach can help redefining priorities to future pedestrian-oriented projects. Vision Zero goals “add-up” to existing priorities defined by the City. With the inclusion of accident data and other factors in the equation, other patterns may be recognized. Ideally this analysis will include more than just 3 sets of data. The PAC (Pedestrian Advisory Council) is working on this, so more updates will come soon. A simple quick analysis of the existing sidewalk infrastructure within the Imagine Austin Centers show how “walkable” these centers currently are. In sum, only 5.03% of total sidewalks are located within these Activity Centers. Downtown Austin, holds 28.04% of all sidewalks within these centers. Why do we want these Centers to be more walkable? Should we prioritize funding on pedestrian infrastructure within these areas? More development about this post will come soon, as other variables will help us understand how we have been building pedestrian infrastructure in our city. A few concepts are introduced to be more publicly accessible and promote empowerment of the community with a data-driven background (to better our decision-making process). While all these ideas introduce a general framework, I believe it is very useful to share it online, so that we gather talent and excited individuals that want to support these ideas. Please send me a message if you are interested in participating somehow. This presentation is based on the concept of “Path as Place” by Ian Lockwood (Toole design). CNU23: fresh inspiration… Enjoy! (turn on english subtitles). The video touches on the integration between transportation and urbanism. With a powerful and simple idea as this, it is simple to understand how wrong is to support automobile infrastructure in a growing city.